Research and science careers alive! Source: ES Moyo CSIR Pretoria. The Grade 11 classes ponder potential careers. Source: ES Moyo CSIR Pretoria. On the 5th August 2014, tens of Grade 11 students from Gauteng schools visited the CSIR's Pretoria campus to see science and research in action. 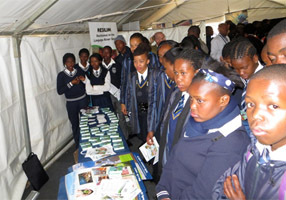 The CSIR event was held as part of the Department of Science and Technology's (DST) National Science Week. 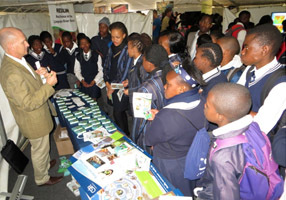 CSIR's Natural Resources and Environment Unit in partnership with the DST and USAID presented a career oriented science lecture to 75 students from the visiting schools during the exhibition. A presentation entitled 'Healthy environment - Healthy life' used a catch phrase that was drawn from the research work carried out by the project partner organisations (CSIR, NOVA Institute, SANParks, Eduardo Mondlane University) in the Olifants River Basin during 2012-2013. It focused on how combined expertise of scientists can be used to help in resolve community problems through research. The joint event was a resounding success that was appreciated by the teachers for presenting practical careers of science using real life examples.